When speculator sentiment gets overwhelmingly bullish, when bad news drives markets higher and they seem like they will never fall again, it’s time to sell. When speculator sentiment gets overwhelmingly bearish, when markets fall no matter what the headlines and you’re positive they will never turn sharply higher, it’s time to steel your resolve and buy. Frequently one hears comments like "commercial reduced their short positions". While arguably accurate, it conveys the wrong idea. Commercial traders, except for producers who do sell short, simply take the opposite side of the trade. 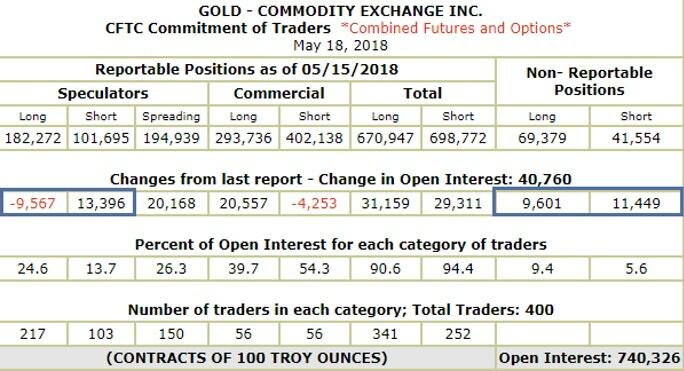 The commercial traders are not net short, they hedge. Thus it is a more accurate summation to call this for what it is: Long liquidation. Gold longs are increasingly unconvinced and are throwing in the towel. I believe speculators throwing in the towel and betting against gold is ultimately bullish.